Powerless lives on the DC Comics fringe; Santa Clarita Diet is delicious. Series Debut: Rebooted before it even premiered: Powerless, which exists somewhere within the DC Comics universe, was originally a deadpan workplace comedy à la The Office, about an insurance firm that handled cases of civilians affected by superhero-vs.-supervillain battles—real catastrophic damage. Now, it's about Wayne Security (as in, Bruce Wayne and Wayne Enterprises), a company specializing in tactical-tech personal-protection devices for non-super humans. It's a faster-paced, colorful upgrade that the cast (Vanessa Hudgens, Alan Tudyk, Danny Pudi, Ron Funches and Christina Kirk) delivers hysterically—when the material's there. 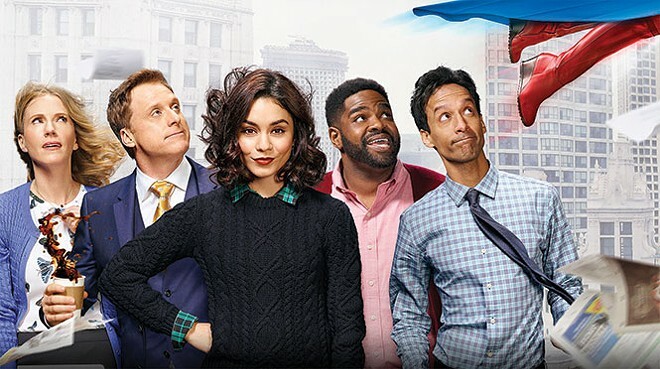 Unfortunately, Powerless' writing isn't as consistent as that of recent NBC comedy breakouts Superstore and The Good Place, so it'll have to be carried by its stars for now. Series Debut: Sitcoms like NBC's The Carmichael Show and CBS' Mom have shown that it's possible for smart comedy, serious issues and ... ugh ... laugh tracks to coexist. But why, why, WHY?! Same goes for Roman numerals and the Super Bowl; it's 2017, start using 'Merican numbers before I tweet at Uncle Cheeto to sign an executive order (and you know he'd do it). Anyway: Superior Donuts centers around a crusty old doughnut shop owner (Judd Hirsch) in a gentrifying Chicago neighborhood who begrudgingly hires an ambitious Millennial (Jermaine Fowler) to update his business. Hot-button issues like race, guns and cronuts are tackled between punchlines, but Superior Donuts tries a little too hard to be Important Commentary (it is based on a play, after all). Just lean into the funny, and maybe I'll forgive the laugh track. Maybe. Series Debut: Netflix's slow reveal of just what is the diet of Santa Clarita was a shrewd move, teasing with an appealing-odd actor combo (Drew Barrymore and Timothy Olyphant) and vague hints at suburban shenanigans for almost a year. The plot-bomb finally dropped a few weeks ago: SoCal realtor couple Sheila (Barrymore) and Joel's (Olyphant) deadly dull lives are upended when Sheila contracts a mild case of zombie-ism and a hunger for human flesh. Thing is, she's never felt better, and life is a whole new, if murder-y, adventure for the couple. Santa Clarita Diet contains traces of Desperate Housewives, Dexter, Weeds and iZombie (no Walking Dead, fortunately), but remains its own unique, bizarro thing. Most surprisingly, drama vet Olyphant consistently upstages Barrymore, letting his comedic freak flag fly like a loose-limbed maniac. Series Debut: Even with 45 cop shows currently set there, Chicago is still a crime-ridden hellscape—will APB finally clean up this town? Probably not, but it'll at least kill an hour after 24: Legacy for a few weeks. Much like—OK, exactly like—CBS' now-canceled Pure Genius, ABP finds a tech billionaire (Justin Kirk) buying a failing enterprise (a Chicago police precinct instead of Pure Genius' hospital) and outfitting it with ultra-high-tech gear to save and/or end people (Pure Genius only flatlined itself). But, for all its flashy screen grids, drones and the "game-changing" APB app (you're outta luck, flip-phoners), APB is just another cop show with an outsider consultant. Series Debut: It's an X-Men TV series—but not. Legion, based on the Marvel comics, follows David Haller (Dan Stevens), who was diagnosed with schizophrenia as a child and has been in and out of psychiatric hospitals for decades. When a disturbing encounter with new patient Syd (Rachel Keller) explodes his mind-numbed world, David realizes that his inner voices and visions are real. Like creator Noah Hawley's previous FX hit, Fargo, Legion looks and feels outside of its defined time, more of an inward psychological trip than a blockbuster Marvel flick. Not that there isn't action and comic relief (like Aubrey Plaza as David's perkily unhinged hospital pal), but don't expect Wolverine.